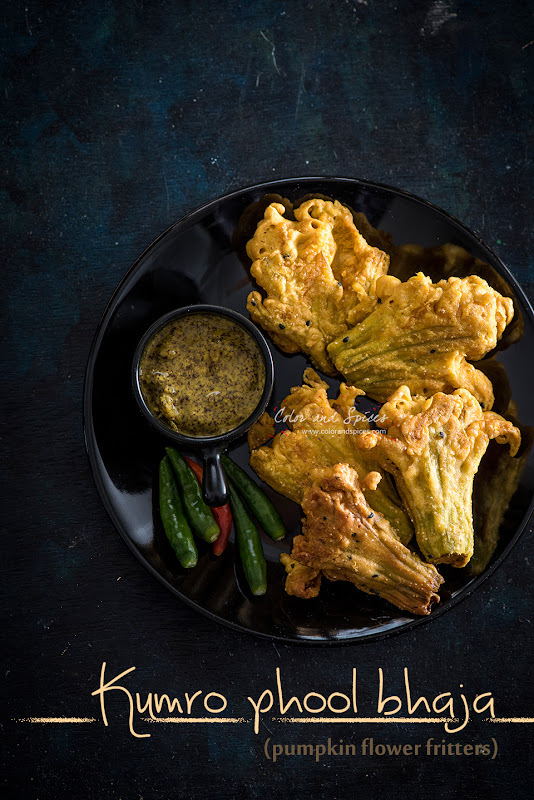 Color and Spices: Kumro phool bhaja.. It's great to receive a bunch of bright yellow flowers as a surprise, but being a foodie it's feels equally good when you see your favorite edible bunch of flower as a surprise gift. Last weekend when S, smilingly handed me these vibrant yellow bunch I was overjoyed. I couldn't resist myself and took pictures of them. They made my winter Sunday morning extra special. Pumpkin flowers, just like zucchini blossom or squash blossom, are very popular in Bengali kitchen. 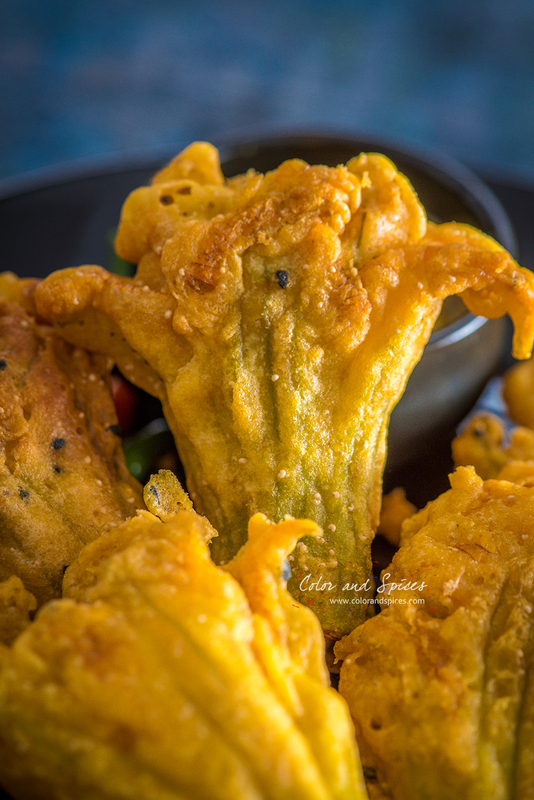 Kumro phool bhaja or pumpkin flower fritter is an traditional age old delicacy of Bengali cuisine. 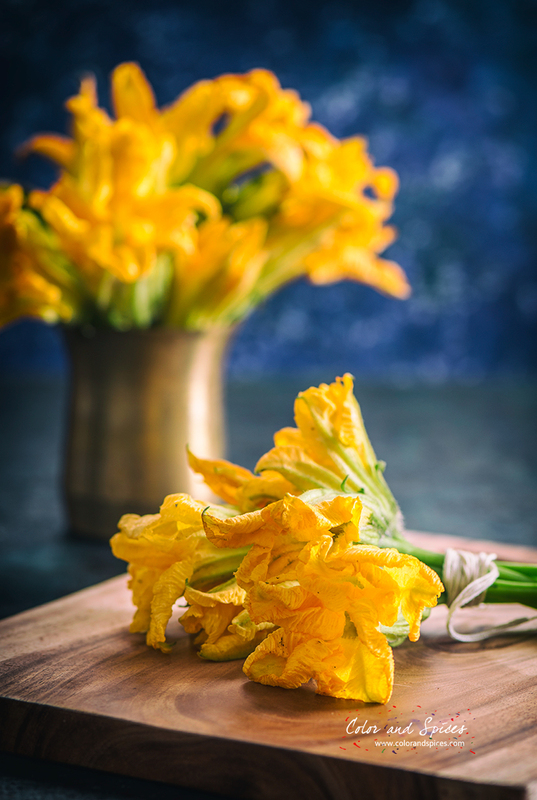 The flowers are dipped in a chickpea batter and deep fried to crispy golden. The flowers can be stuffed with coconut, poppy seed paste as well. This time I have done it a very simple way, without any stuffing. I dipped the pumpkin flowers in the chickpea batter and deep fried them. 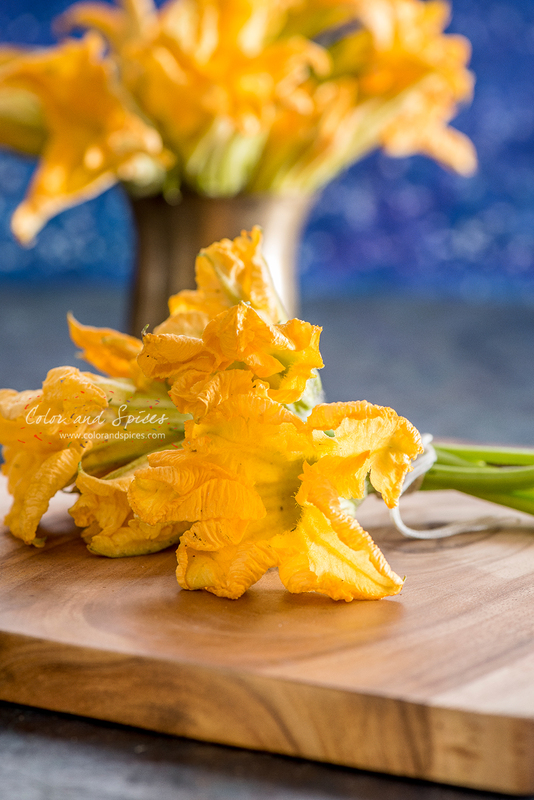 If you do not get pumpkin flowers try this with zucchini blossoms. 1. Cut and clean the pumpkin flowers. Cut the flower from the stem and remove any green part, slit the flower to take out the stamen. Please refer the following video, to know how to cut and clean the pumpkin flowers. Wash them well, and drain any excess water. 2. In a bowl take chickpea flour, rice flour, salt, turmeric powder, red chili powder and mix with water and make a thick but runny batter. Beat the batter well. Rest the batter for 10-15 mins. Add kalojire (black seed), poppy seeds and mix well. 3. Heat oil in a deep pan or kadhai. 4. Dip the flower in the chickpea batter shake off any excess batter, and deep fry in hot oil. Serve immediately with steamed rice and dal. If you like to get regular updates from me go to my Facebook page and click on the Like button. You can also follow me on Twitter (@Kcolorandspices) and Instagram (@colorandspices) Thank you..!! !